Big Man is that hangry, grumpy, self-destructive beast that lies dormant in all of us until we hit that perfect combination of insufficient sleep and no food. That is when the Big Man emerges. 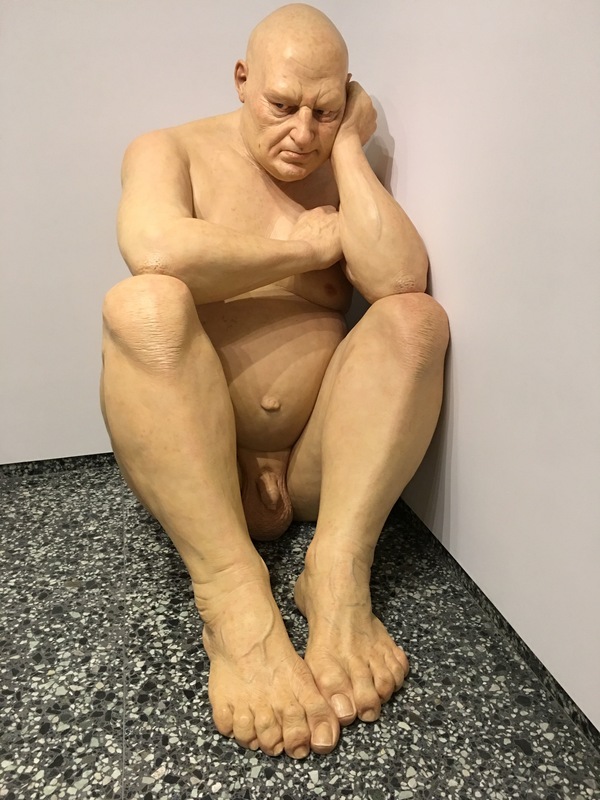 Ron Mueck, the creator of this lil' (7 foot tall) guy, decided that he would use a model for this sculpture - something outside of his repertoire. He hired what the modeling world calls a “smoothie,”aka a completely hairless man. The off-putting-ness has already begun. Mueck’s own recollection of the incident is the best. He explains, “I was also not used to having a model in the studio. I found it quite intimidating, because there’s another person demanding to be related to. And this guy was naked and completely shaven. He didn’t have a single hair on his body. He was quite disturbing. I thought, ‘Right, what am I going to do with this naked man?’ I asked him to sit in the corner while I figured this out. He suggested some poses that he might be able to strike for me, and he took on all these ridiculous classical poses that live models like. They were so phony and unnatural, and I realized there was nothing at all I could do with him. As I was summoning the courage to ask him to leave early, I glanced over at him in the corner waiting for me to make my mind up. He wasn’t quite as belligerent as the sculpture ended up, but he was in that position. And I thought, ‘That looks good.’ So that’s how I came about the pose.” After the initial awkwardness, it was still very awkward but out of it came Big Man and for that we are forever grateful. This sculpture is now one of the most popular in contemporary art. It’s up there with Yayoi Kusama’s Infinity Mirrors as one of the most Instagrammable works....but unfortunately searching #bigman on Instagram only leads you to a lot of insecure body builders. You’ll just have to go to the Hirshhorn and see for yourself. Tanguy, Sarah. 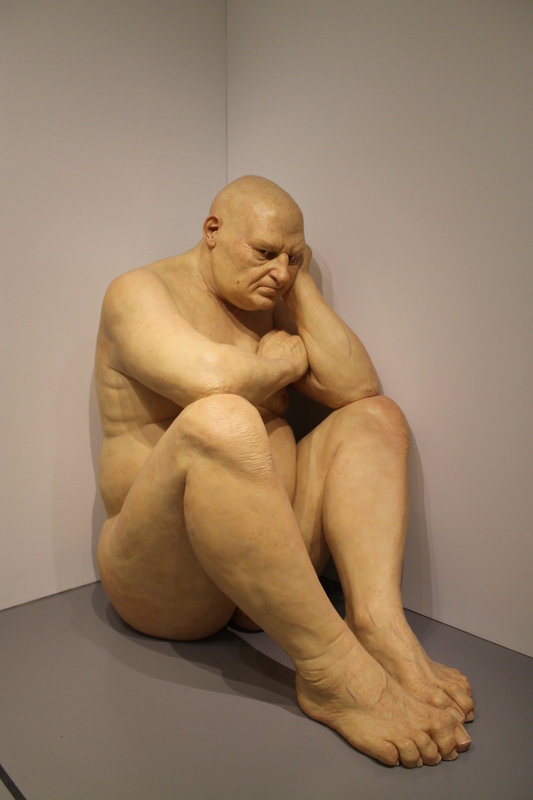 "The Progress Big Man: A Conversation With Ron Mueck By Sarah Tanguy - Sculpture.Org". Sculpture.org. N.p., 2003. Web. 12 May 2017. A "Big Man" At The Hirshhorn. Washington, D.C.: Smithsonian Magazine, 2010. Video. Lawrence, Sidney. "'Big Man,' Still Exerting A Gigantic Hold On Museum-Goers". Washington Post. N.p., 2003. Web. 12 May 2017.